Get your hands on tickets for a glittering night of pop in The Sugar Club this Thursday, April 4. Competitions 8 January, 2019 . Written by Peter Dunne . Feeling lucky and need a pop fix? Why not try get your hands on tickets for the Sing Along Social Pop Battle in The Sugar Club this Thursday as princess of pop, Kylie Minogue, takes on pretender to the throne, Katy Perry?! We have two pairs up for grabs! Chief Craic Mechanic Aoife Mc of Sing Along Social thinks Katy Perry is the ultimate teenage dream. Maura Darragh, Sing Along Social craic mechanic and resident Drag Queen, simply can not get Kylie out of her head. Aoife and Darragh want to settle a private argument on a public stage – who has better songs: Katy or Kylie?! What will happen when we pit these two pop queens against each other in a pop battle? Fireworks? Spinning around en masse? Join the gang on Thursday, April 4 at The Sugar Club to find out. They’ll be serving up Katy VS Kylie Pop Battle from 8pm to 9pm followed by a Pop Queen Disco from 9pm to 11pm. Expect Beyonce, Madonna, Christina, Whitney, Britney, Rihanna, Ariana, and loads more. Doors open at 7pm and there’ll be singing by 8pm sharp. For those who aren’t lucky enough to get their mitts on the prize, tickets for the unmissable event are only €10 + booking online or €15 on the door on the night. They’ll be donating 20% of proceeds after costs to Joyful Noise, an inclusive community music project based in Dublin 12. 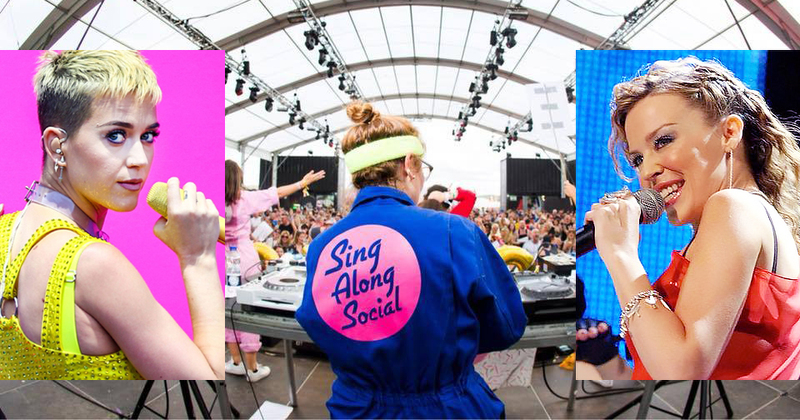 For those who worry their pipes aren’t up to the task, Sing Along Social is a zero-commitment choir designed for people who can’t sing. It’s like group karaoke with no microphones and no putting anyone on the spot. You don’t have to know the words, and you don’t even have to be able to sing. It’s about caterwauling along to your favourite songs in the company of friends and strangers. 8 January, 2019 . Written by Peter Dunne .